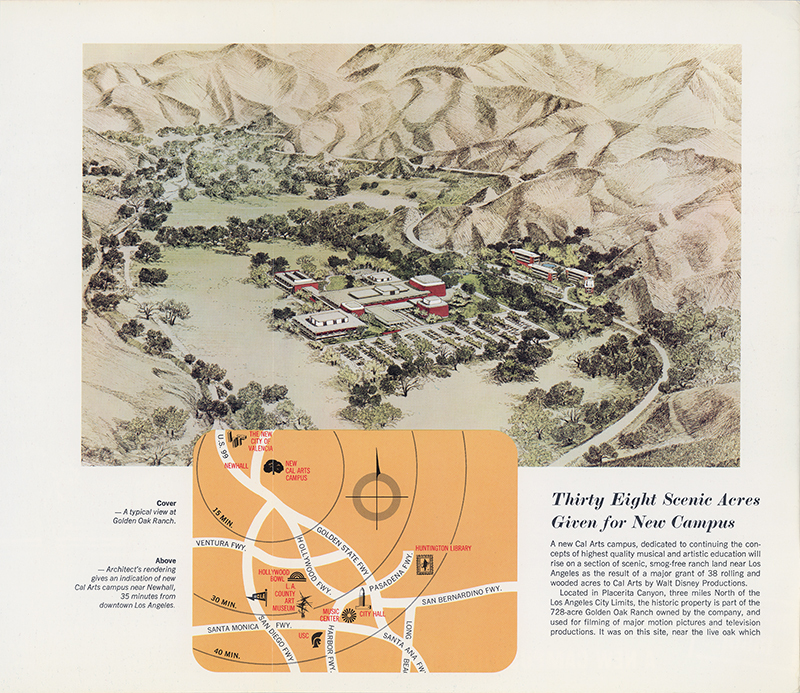 SCVHistory.com | CalArts | A New Campus for Cal Arts ... In Placerita Canyon, 1965-66. 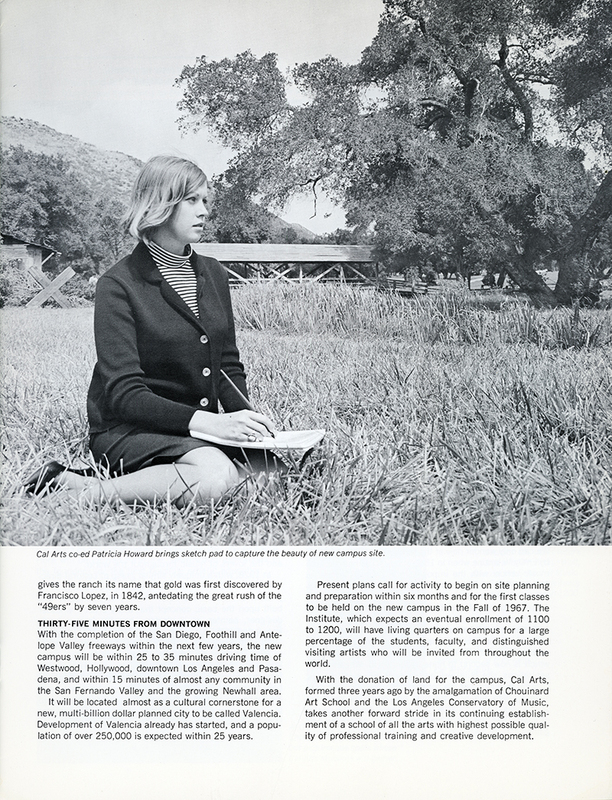 "A New Campus for Cal Arts" — at The Walt Disney Co.'s Golden Oak Ranch in Placerita Canyon. 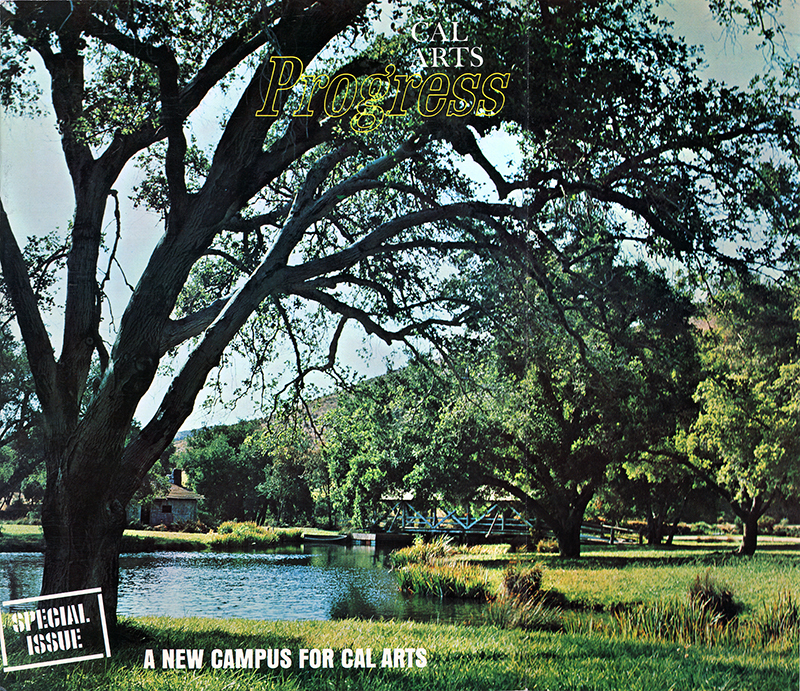 As noted herein (body copy and photo caption), Walt Disney Productions deeded 38 acres to the CalArts Board of Trustees. 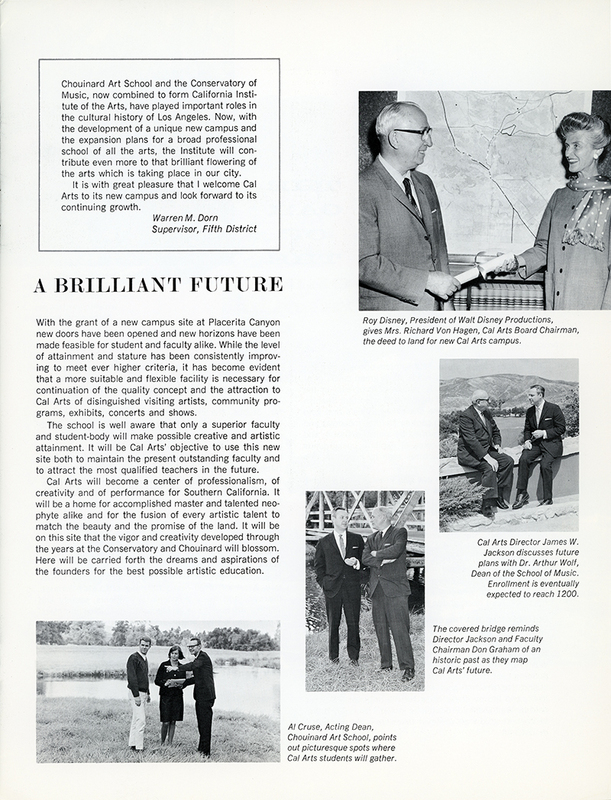 Undated 8½x11-inch promotional piece, 16 pages including cover, late 1965 or early 1966, titled "Cal Arts Progress." 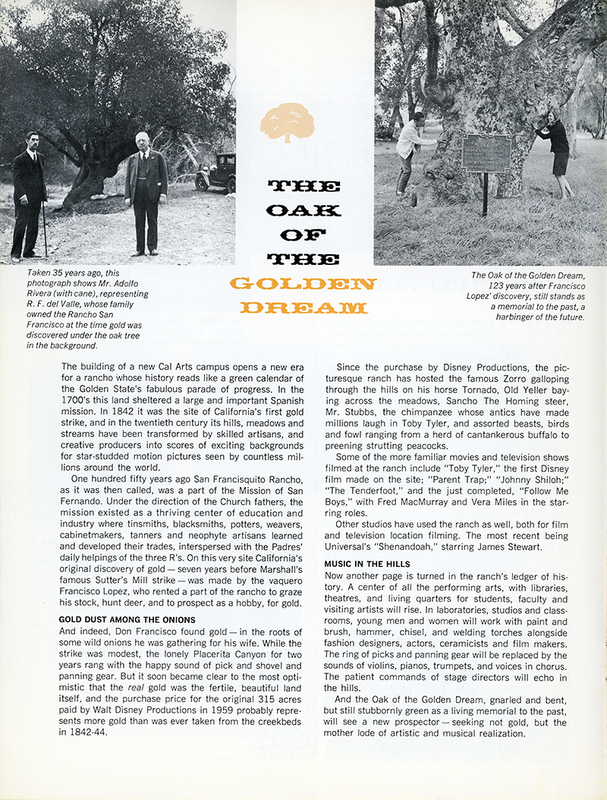 As for the date, the text mentions a recent music festival that was held at Long Beach City College in August 1965, and it anticipates financing and construction to start and finish by the fall of 1967. A new Cal Arts campus, dedicated to continuing the concepts of highest quality musical and artistic education will rise on a section of scenic, smog-free ranch land near Los Angeles as the result of a major grant of 38 rolling and wooded acres to Cal Arts by Walt Disney Productions. Located in Placerita Canyon, three miles North of the Los Angeles City Limits, the historic property is part of the 728-acre Golden Oak Ranch owned by the company, and used for filming of major motion pictures and television productions. 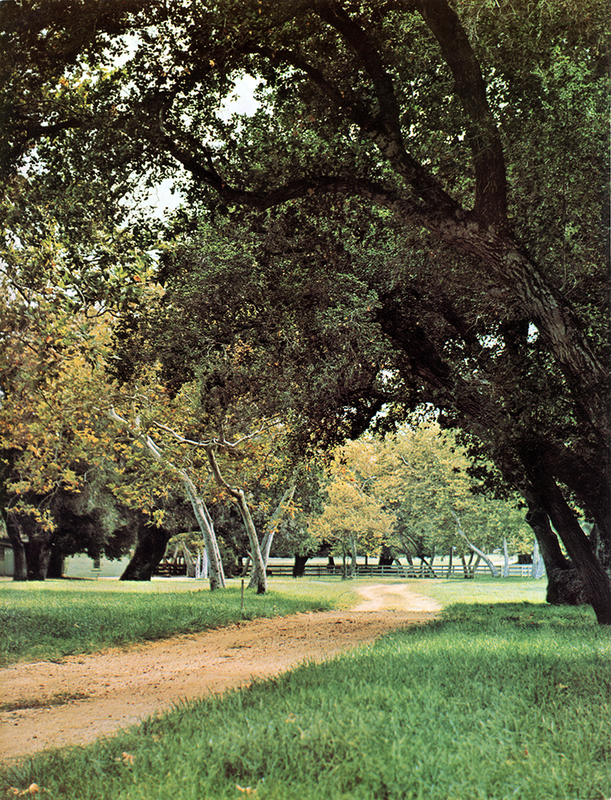 It was on this site, near the live oak which gives the ranch its name that gold was first discovered by Francisco Lopez, in 1842, antedating the great rush of the "49ers" by seven years. With the completion of the San Diego, Foothill and Antelope Valley freeways within the next few years, the new campus will be within 25 to 35 minutes driving time of Westwood, Hollywood, downtown Los Angeles and Pasadena, and within 15 minutes of almost any community in the San Fernando Valley and the growing Newhall area. It will be located almost as a cultural cornerstone for a new, multi-billion dollar planned city to be called Valencia. Development of Valencia already has started, and a population of over 250,000 is expected within 25 years. 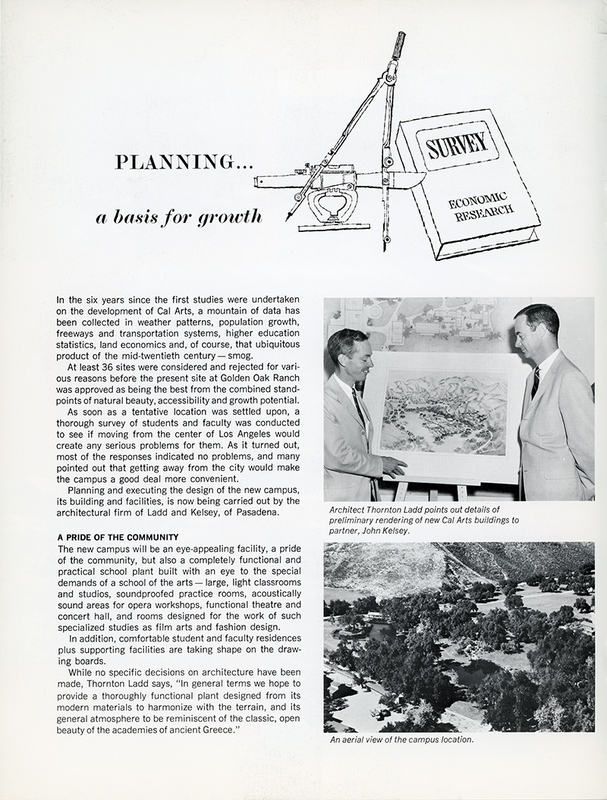 Present plans call for activity to begin on site planning and preparation within six months and for the first classes to be held on the new campus in the Fall of 1967. The Institute, which expects an eventual enrollment of 1100 to 1200, will have living quarters on campus for a large percentage of the students, faculty, and distinguished visiting artists who will be invited from throughout the world. 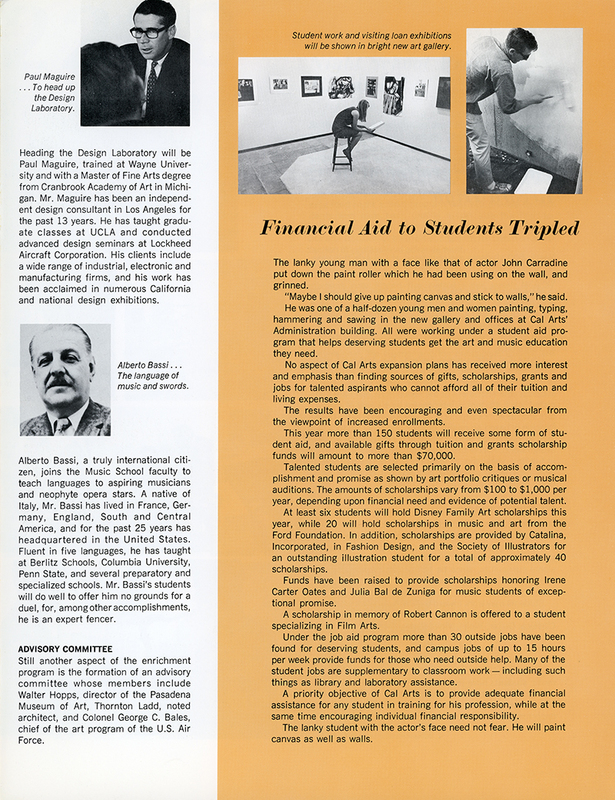 With the donation of land for the campus, Cal Arts, formed three years ago by the amalgamation of Chouinard Art School and the Los Angeles Conservatory of Music, takes another forward stride in its continuing establishment of a school of all the arts with highest possible quality of professional training and creative development. We can only wonder now of the thoughts and dreams held by Emily Valentine when in 1883 she first opened the little music school with the imposing title, "The Los Angeles Conservatory of Music and the Arts," in a modest two-story frame house at Fourth and Main streets in Los Angeles, somewhat away from the rush and bustle of what was then "downtown." But we can marvel at her vision and her grasp of the spirit of this burgeoning village, a spirit which built a cultural and educational environment in less than 100 years, which is now second to none in the world. Whatever her aspirations, she built well and through 80 years of civic cultural development the conservatory operated with consistently high quality of training. And every few years the school was moved "a little further away" from the center of town. Over the years the Conservatory prospered and gained stature and produced an outstanding list of alumni who were to give pleasure and spirit to the community and the lovers of music throughout the world. In 1928, with a uniquely similar grasp of cultural direction, Nelbert Chouinard established her art institute at its present site near MacArthur Park. This institution was built upon the basic concept that every artist — whether designer, painter, or illustrator — benefits from a basic knowledge and training in every other art. 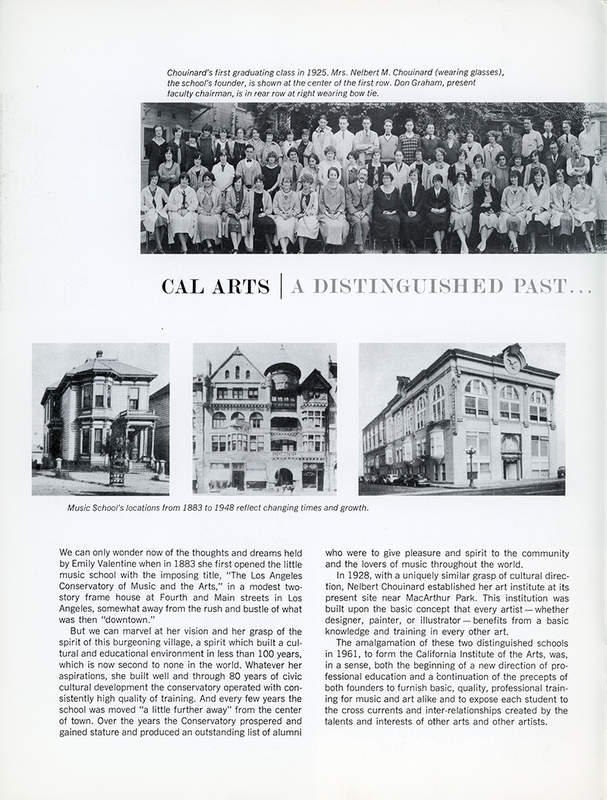 The amalgamation of these two distinguished schools in 1961, to form the California Institute of the Arts, was, in a sense, both the beginning of a new direction of professional education and a continuation of the precepts of both founders to furnish basic, quality, professional training for music and art alike and to expose each student to the cross currents and inter-relationships created by the talents and interests of other arts and other artists. "Chouinard Art School and the Conservatory of Music, now combined to form California Institute of the Arts, have played important roles in the cultural history of Los Angeles. Now, with the development of a unique new campus and the expansion plans for a broad professional school of all the arts, the Institute will contribute even more to that brilliant flowering of the arts which is taking place in our city. "It is with great pleasure that I welcome Cal Arts to its new campus and look forward to its continuing growth." With the grant of a new campus site at Placerita Canyon new doors have been opened and new horizons have been made feasible for student and faculty alike. 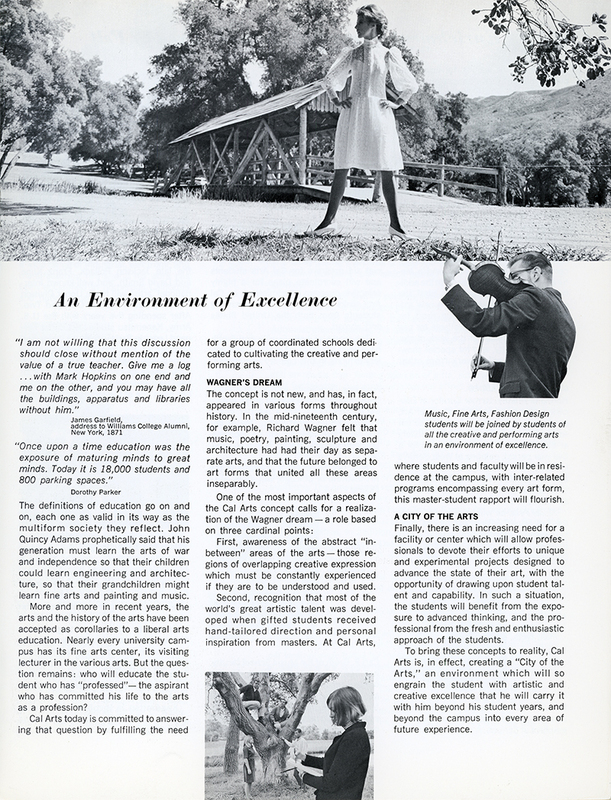 While the level of attainment and stature has been consistently improving to meet ever higher criteria, it has become evident that a more suitable and flexible facility is necessary for continuation of the quality concept and the attraction to Cal Arts of distinguished visiting artists, community programs, exhibits, concerts and shows. The school is well aware that only a superior faculty and student-body will make possible creative and artistic attainment. It will be Cal Arts' objective to use this new site both to maintain the present outstanding faculty and to attract the most qualified teachers in the future. Cal Arts will become a center of professionalism, of creativity and of performance for Southern California. It will be a home for accomplished master and talented neophyte alike and for the fusion of every artistic talent to match the beauty and the promise of the land. It will be on this site that the vigor and creativity developed through the years at the Conservatory and Chouinard will blossom. Here will be carried forth the dreams and aspirations of the founders for the best possible artistic education. The building of a new Cal Arts campus opens a new era for a rancho whose history reads like a green calendar of the Golden State's fabulous parade of progress. In the 1700's this land sheltered a large and important Spanish mission. 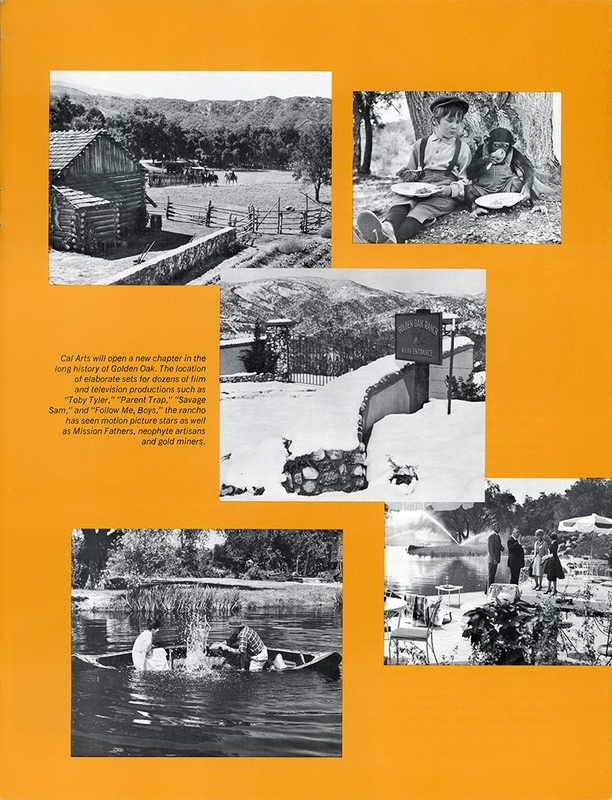 In 1842 it was the site of California's first gold strike, and in the twentieth century its hills, meadows and streams have been transformed by skilled artisans, and creative producers into scores of exciting backgrounds for star-studded motion pictures seen by countless millions around the world. One hundred fifty years ago San Francisquito Rancho, as it was then called, was a part of the Mission of San Fernando. Under the direction of the Church fathers, the mission existed as a thriving center of education and industry where tinsmiths, blacksmiths, potters, weavers, cabinetmakers, tanners and neophyte artisans learned and developed their trades, interspersed with the Padres' daily helpings of the three R's. On this very site California's original discovery of gold — seven [sic] years before Marshall's famous Sutter's Mill strike — was made by the vaquero Francisco Lopez, who rented a part of the rancho to graze his stock, hunt deer, and to prospect as a hobby, for gold. And indeed, Don Francisco found gold — in the roots of some wild onions he was gathering for his wife. While the strike was modest, the lonely Placerita Canyon for two years rang with the happy sound of pick and shovel and panning gear. But it soon became clear to the most optimistic that the real gold was the fertile, beautiful land itself, and the purchase price for the original 315 acres paid by Walt Disney Productions in 1959 probably represents more gold than was ever taken from the creekbeds in 1842-44. Since the purchase by Disney Productions, the picturesque ranch has hosted the famous Zorro galloping through the hills on his horse Tornado, Old Yeller baying across the meadows, Sancho The Homing steer, Mr. Stubbs, the chimpanzee whose antics have made millions laugh in Toby Tyler, and assorted beasts, birds and fowl ranging from a herd of cantankerous buffalo to preening strutting peacocks. Some of the more familiar movies and television shows filmed at the ranch include "Toby Tyler," the first Disney film made on the site; "Parent Trap;" "Johnny Shiloh;" "The Tenderfoot," and the just completed, "Follow Me Boys," with Fred MacMurray and Vera Miles in the starring roles. Other studios have used the ranch as well, both for film and television location filming. The most recent being Universal's "Shenandoah," starring James Stewart. Now another page is turned in the ranch's ledger of history. A center of all the performing arts, with libraries, theatres, and living quarters for students, faculty and visiting artists will rise. In laboratories, studios and classrooms, young men and women will work with paint and brush, hammer, chisel, and welding torches alongside fashion designers, actors, ceramicists and film makers. The ring of picks and panning gear will be replaced by the sounds of violins, pianos, trumpets, and voices in chorus. The patient commands of stage directors will echo in the hills. And the Oak of the Golden Dream, gnarled and bent, but still stubbornly green as a living memorial to the past, will see a new prospector — seeking not gold, but the mother lode of artistic and musical realization. Cal Arts will open a new chapter in the long history of Golden Oak. The location of elaborate sets for dozens of film and television productions such as "Toby Tyler," "Parent Trap," "Savage Sam," and "Follow Me, Boys," the rancho has seen motion picture stars as well as Mission Fathers, neophyte artisans and gold miners. In the six years since the first studies were undertaken on the development of Cal Arts, a mountain of data has been collected in weather patterns, population growth, freeways and transportation systems, higher education statistics, land economics and, of course, that ubiquitous product of the mid-twentieth century — smog. At least 36 sites were considered and rejected for various reasons before the present site at Golden Oak Ranch was approved as being the best from the combined standpoints of natural beauty, accessibility and growth potential. 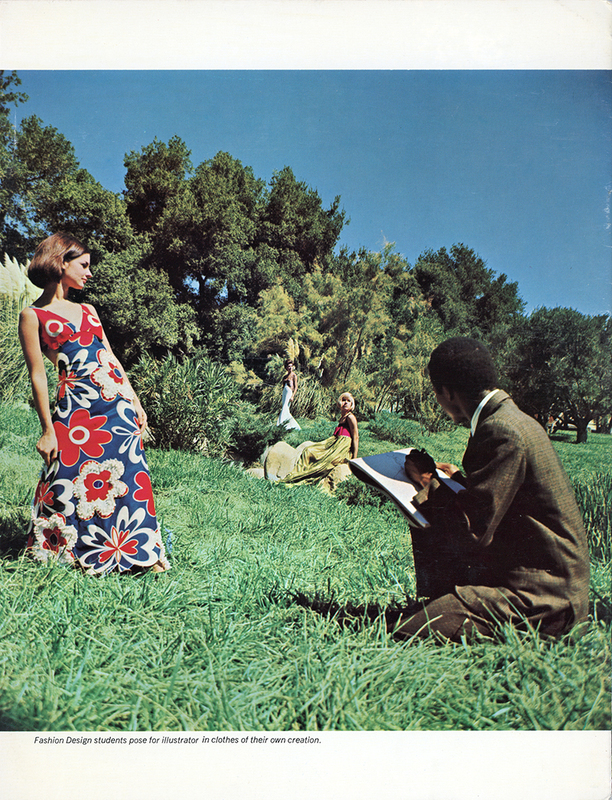 As soon as a tentative location was settled upon, a thorough survey of students and faculty was conducted to see if moving from the center of Los Angeles would create any serious problems for them. As it turned out, most of the responses indicated no problems, and many pointed out that getting away from the city would make the campus a good deal more convenient. Planning and executing the design of the new campus, its building and facilities, is now being carried out by the architectural firm of Ladd and Kelsey, of Pasadena. The new campus will be an eye-appealing facility, a pride of the community, but also a completely functional and practical school plant built with an eye to the special demands of a school of the arts — large, light classrooms and studios, soundproofed practice rooms, acoustically sound areas for opera workshops, functional theatre and concert hall, and rooms designed for the work of such specialized studies as film arts and fashion design. In addition, comfortable student and faculty residences plus supporting facilities are taking shape on the drawing boards. While no specific decisions on architecture have been made, Thornton Ladd says, "In general terms we hope to provide a thoroughly functional plant designed from its modern materials to harmonize with the terrain, and its general atmosphere to be reminiscent of the classic, open beauty of the academies of ancient Greece." "I am not willing that this discussion should close without mention of the value of a true teacher. Give me a log ... with Mark Hopkins on one end and me on the other, and you may have all the buildings, apparatus and libraries without him." "Once upon a time education was the exposure of maturing minds to great minds. Today it is 18,000 students and 800 parking spaces." The definitions of education go on and on, each one as valid in its way as the multiform society they reflect. John Quincy Adams prophetically said that his generation must learn the arts of war and independence so that their children could learn engineering and architecture, so that their grandchildren might learn fine arts and painting and music. More and more in recent years, the arts and the history of the arts have been accepted as corollaries to a liberal arts education. Nearly every university campus has its fine arts center, its visiting lecturer in the various arts. But the question remains: who will educate the student who has "professed" — the aspirant who has committed his life to the arts as a profession? Cal Arts today is committed to answering that question by fulfilling the need for a group of coordinated schools dedicated to cultivating the creative and performing arts. The concept is not new, and has, in fact, appeared in various forms throughout history. In the mid-nineteenth century, for example, Richard Wagner felt that music, poetry, painting, sculpture and architecture had had their day as separate arts, and that the future belonged to art forms that united all these areas inseparably. First, awareness of the abstract "in-between" areas of the arts — those regions of overlapping creative expression which must be constantly experienced if they are to be understood and used. Second, recognition that most of the world's great artistic talent was developed when gifted students received hand-tailored direction and personal inspiration from masters. At Cal Arts, where students and faculty will be in residence at the campus, with inter-related programs encompassing every art form, this master-student rapport will flourish. Finally, there is an increasing need for a facility or center which will allow professionals to devote their efforts to unique and experimental projects designed to advance the state of their art, with the opportunity of drawing upon student talent and capability. In such a situation, the students will benefit from the exposure to advanced thinking, and the professional from the fresh and enthusiastic approach of the students. 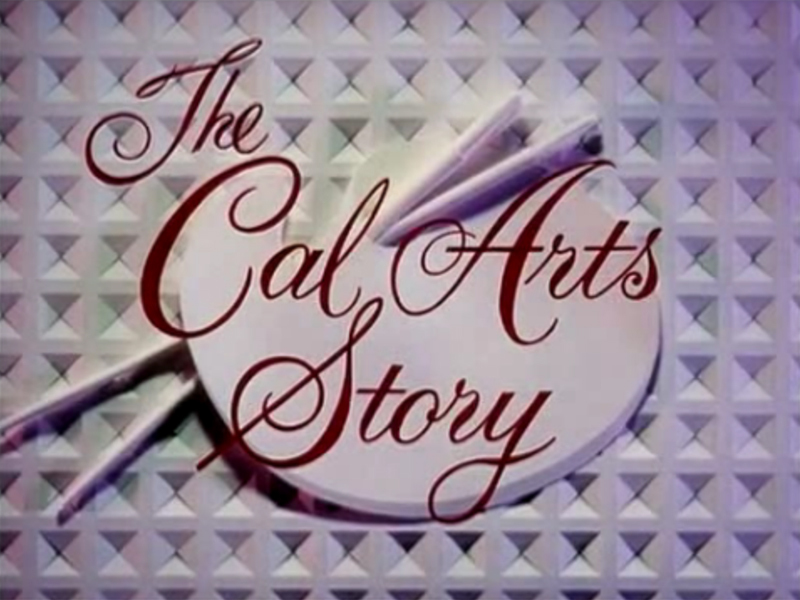 To bring these concepts to reality, Cal Arts is, in effect, creating a "City of the Arts," an environment which will so engrain the student with artistic and creative excellence that he will carry it with him beyond his student years, and beyond the campus into every area of future experience. There will be no waiting for new campus facilities to start improvement in the quality of program and activity of Cal Arts. A solidly-planned, long-range enrichment program, instituted this summer, already is having a strong and encouraging effect on staff, students, and faculty. The program, designed to provide fresh and stimulating creative viewpoints, to broaden and complement the scope of instruction, and to expand financial and scholarship aid opportunities for students, is evident in every phase of present Cal Arts activity. A number of key staff and faculty appointments have been made, an Advisory Board has been established, an alumni committee is being formed, and a lecture program is under way. With the addition of a new administrative staff the school has, as well, installed a new gallery, which is already being used for exhibitions, and will be available for use throughout the year for the work of students and faculty, and for special showings of outstanding work from other artists. Harold C. Friedly, former Curator of Education of the Pasadena Museum of Art, has taken a position as Assistant to the Acting Director. Friedly studied History at the University of Kentucky and for a five year period, painting at West Berlin's H.F.B.K. Art Academy, and art history and architecture at the Technical University. He was accepted as Meister Schuler at the Art Academy. At Cal Arts, he will be responsible for the Extension Division, exhibitions, special events, institutional studies, and improvement programs affecting both Chouinard and the School of Music. Donald E. Smith comes to Cal Arts as Director of Admissions from teaching graphics at Scripps. A student of art education, painting, sculpture and drawing in Illinois schools, Smith received his Master of Fine Arts at Claremont. He will be in charge of a greatly-expanded financial aid program for Cal Arts students and will coordinate plans for a highly selective program of admissions as Cal Arts seeks to find and train outstanding students from both the United States and abroad. The works of both Friedly and Smith have been shown in art museum and gallery exhibits in this country and abroad. Assisting Don Smith will be Miss Elizabeth Eklund, a professional artist, graduate of Chouinard, and a teacher in the fashion design department. One of her special responsibilities will be coordination with secondary schools and counseling. Mrs. Norma Green, a graduate of the Art Institute of Chicago, will assist Miss Eklund. Matsumi Kanemitsu, close associate of the late Jackson Pollack, Franz Kline and David Smith, and well-known international artist will teach Upper Division Painting Lab in Terms One and Two. After spending five years with the U.S. Army, Kanemitsu studied art under Fer-nand Leger in Paris, sculpture under Karl Metzler in Baltimore, and attended famed Art Student's League in New York, where he became associated with the "New York School" of painters which has been one of the strongest influences on art in modern times. He has exhibited in more than 65 shows throughout the United States, Europe and Japan, and is included in many museum permanent collections, among them, the collection of the Los Angeles County Art Museum. Kanemitsu will be no stranger to Los Angeles for, in addition to having had his work shown here many times, he spent two months at June Wayne's brilliant Tamarind Workshop producing lithographs in company with skilled artisans there. Kanemitsu is involved not only in painting, but also in calligraphy, drawing and collage. Heading the Design Laboratory will be Paul Maguire, trained at Wayne University and with a Master of Fine Arts degree from Cranbrook Academy of Art in Michigan. Mr. Maguire has been an independent design consultant in Los Angeles for the past 13 years. He has taught graduate classes at UCLA and conducted advanced design seminars at Lockheed Aircraft Corporation. His clients include a wide range of industrial, electronic and manufacturing firms, and his work has been acclaimed in numerous California and national design exhibitions. Alberto Bassi, a truly international citizen, joins the Music School faculty to teach languages to aspiring musicians and neophyte opera stars. A native of Italy, Mr. Bassi has lived in France, Germany, England, South and Central America, and for the past 25 years has headquartered in the United States. Fluent in five languages, he has taught at Berlitz Schools, Columbia University, Penn State, and several preparatory and specialized schools. Mr. Bassi's students will do well to offer him no grounds for a duel, for, among other accomplishments, he is an expert fencer. Still another aspect of the enrichment program is the formation of an advisory committee whose members include Walter Hopps, director of the Pasadena Museum of Art, Thornton Ladd, noted architect, and Colonel George C. Bales, chief of the art program of the U.S. Air Force. The lanky young man with a face like that of actor John Carradine put down the paint roller which he had been using on the wall, and grinned. "Maybe I should give up painting canvas and stick to walls," he said. He was one of a half-dozen young men and women painting, typing, hammering and sawing in the new gallery and offices at Cal Arts' Administration building. All were working under a student aid program that helps deserving students get the art and music education they need. No aspect of Cal Arts expansion plans has received more interest and emphasis than finding sources of gifts, scholarships, grants and jobs for talented aspirants who cannot afford all of their tuition and living expenses. The results have been encouraging and even spectacular from the viewpoint of increased enrollments. This year more than 150 students will receive some form of student aid, and available gifts through tuition and grants scholarship funds will amount to more than $70,000. Talented students are selected primarily on the basis of accomplishment and promise as shown by art portfolio critiques or musical auditions. The amounts of scholarships vary from $100 to $1,000 per year, depending upon financial need and evidence of potential talent. At least six students will hold Disney Family Art scholarships this year, while 20 will hold scholarships in music and art from the Ford Foundation. In addition, scholarships are provided by Catalina, Incorporated, in Fashion Design, and the Society of Illustrators for an outstanding illustration student for a total of approximately 40 scholarships. Funds have been raised to provide scholarships honoring Irene Carter Oates and Julia Bal de Zuniga for music students of exceptional promise. A scholarship in memory of Robert Cannon is offered to a student specializing in Film Arts. Under the job aid program more than 30 outside jobs have been found for deserving students, and campus jobs of up to 15 hours per week provide funds for those who need outside help. 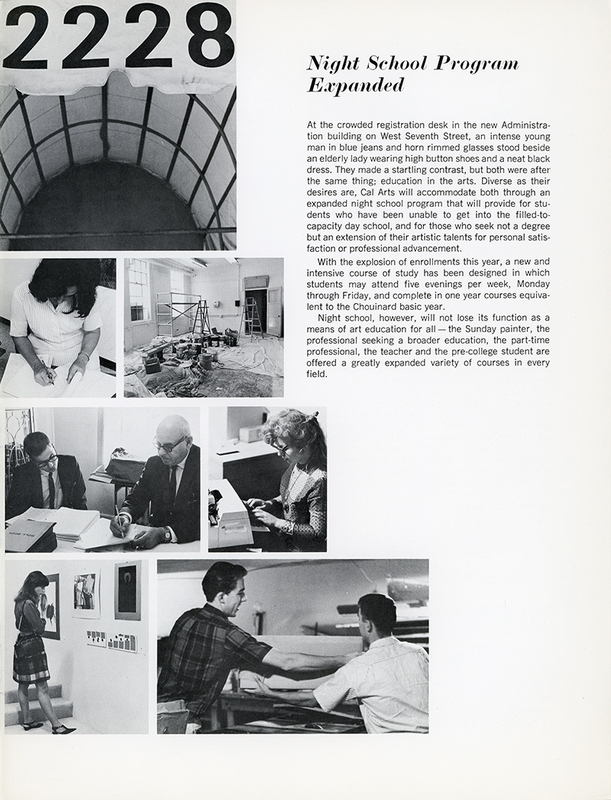 Many of the student jobs are supplementary to classroom work — including such things as library and laboratory assistance. A priority objective of Cal Arts is to provide adequate financial assistance for any student in training for his profession, while at the same time encouraging individual financial responsibility. The lanky student with the actor's face need not fear. He will paint canvas as well as walls. Nearly 500 students are registered at Cal Arts this year, marking a record enrollment for the three-year old institution. More than 415 are taking courses at Chouinard and 70 are studying at the School of Music on a full and part-time basis. Fine Arts and Advertising Design attract the highest numbers of students with approximately 100 each, followed by Film Arts, Illustration, Design and Fashion Design and Ceramics. 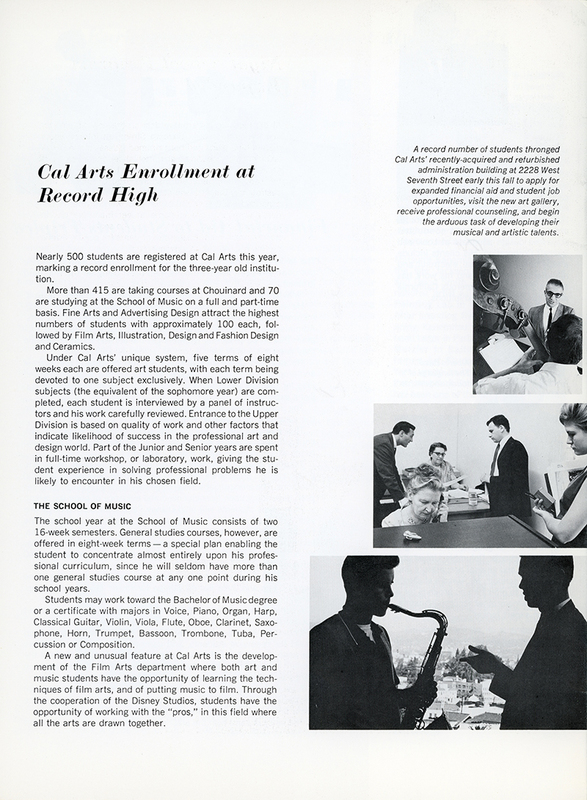 Under Cal Arts' unique system, five terms of eight weeks each are offered art students, with each term being devoted to one subject exclusively. When Lower Division subjects (the equivalent of the sophomore year) are completed, each student is interviewed by a panel of instructors and his work carefully reviewed. Entrance to the Upper Division is based on quality of work and other factors that indicate likelihood of success in the professional art and design world. Part of the Junior and Senior years are spent in full-time workshop, or laboratory, work, giving the student experience in solving professional problems he is likely to encounter in his chosen field. The school year at the School of Music consists of two 16-week semesters. General studies courses, however, are offered in eight-week terms — a special plan enabling the student to concentrate almost entirely upon his professional curriculum, since he will seldom have more than one general studies course at any one point during his school years. Students may work toward the Bachelor of Music degree or a certificate with majors in Voice, Piano, Organ, Harp, Classical Guitar, Violin, Viola, Flute, Oboe, Clarinet, Saxophone, Horn, Trumpet, Bassoon, Trombone, Tuba, Percussion or Composition. A new and unusual feature at Cal Arts is the development of the Film Arts department where both art and music students have the opportunity of learning the techniques of film arts, and of putting music to film. Through the cooperation of the Disney Studios, students have the opportunity of working with the "pros," in this field where all the arts are drawn together. At the crowded registration desk in the new Administration building on West Seventh Street, an intense young man in blue jeans and horn rimmed glasses stood beside an elderly lady wearing high button shoes and a neat black dress. They made a startling contrast, but both were after the same thing; education in the arts. Diverse as their desires are, Cal Arts will accommodate both through an expanded night school program that will provide for students who have been unable to get into the filled-to-capacity day school, and for those who seek not a degree but an extension of their artistic talents for personal satisfaction or professional advancement. With the explosion of enrollments this year, a new and intensive course of study has been designed in which students may attend five evenings per week, Monday through Friday, and complete in one year courses equivalent to the Chouinard basic year. Night school, however, will not lose its function as a means of art education for all — the Sunday painter, the professional seeking a broader education, the part-time professional, the teacher and the pre-college student are offered a greatly expanded variety of courses in every field. 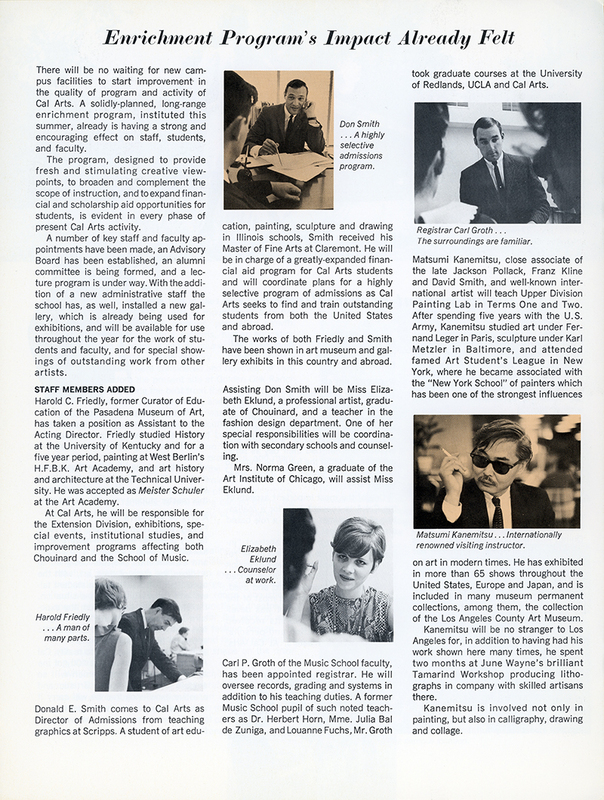 With the excitement and promotion of the present enrichment program and the announcement of the new campus site, several key alumni have indicated a strong interest in forming an Association which can be of service to Cal Arts in both advisory roles and in active participation. Edith Head and Nelson Riddle met with Trustee Walt Disney several weeks ago to discuss ways in which the alumni can be of service, and they are planning a second meeting this month with two or three additional former students to set up an Association structure, work out a program of organization and decide where they can be of most help. 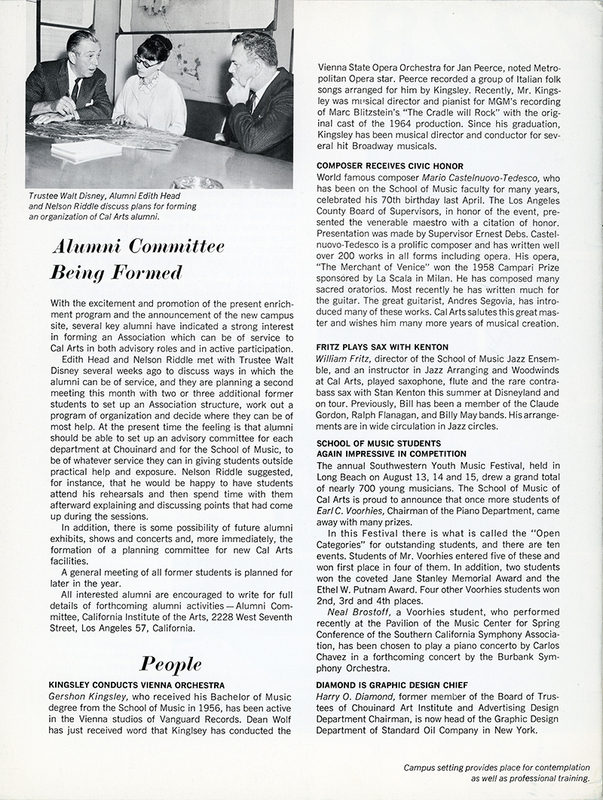 At the present time the feeling is that alumni should be able to set up an advisory committee for each department at Chouinard and for the School of Music, to be of whatever service they can in giving students outside practical help and exposure. Nelson Riddle suggested, for instance, that he would be happy to have students attend his rehearsals and then spend time with them afterward explaining and discussing points that had come up during the sessions. In addition, there is some possibility of future alumni exhibits, shows and concerts and, more immediately, the formation of a planning committee for new Cal Arts facilities. A general meeting of all former students is planned for later in the year. All interested alumni are encouraged to write for full details of forthcoming alumni activities — Alumni Committee, California Institute of the Arts, 2228 West Seventh Street, Los Angeles 57, California. Gershon Kingsley, who received his Bachelor of Music degree from the School of Music in 1956, has been active in the Vienna studios of Vanguard Records. Dean Wolf has just received word that Kinglsey has conducted the Vienna State Opera Orchestra for Jan Peerce, noted Metropolitan Opera star. Peerce recorded a group of Italian folk songs arranged for him by Kingsley. Recently, Mr. Kings-ley was musical director and pianist for MGM's recording of Marc Blitzstein's "The Cradle will Rock" with the original cast of the 1964 production. Since his graduation, Kingsley has been musical director and conductor for several hit Broadway musicals. World famous composer Mario Castelnuovo-Tedesco, who has been on the School of Music faculty for many years, celebrated his 70th birthday last April. The Los Angeles County Board of Supervisors, in honor of the event, presented the venerable maestro with a citation of honor. Presentation was made by Supervisor Ernest Debs. Castelnuovo-Tedesco is a prolific composer and has written well over 200 works in all forms including opera. His opera, "The Merchant of Venice" won the 1958 Campari Prize sponsored by La Scala in Milan. He has composed many sacred oratorios. Most recently he has written much for the guitar. The great guitarist, Andres Segovia, has introduced many of these works. Cal Arts salutes this great master and wishes him many more years of musical creation. William Fritz, director of the School of Music Jazz Ensemble, and an instructor in Jazz Arranging and Woodwinds at Cal Arts, played saxophone, flute and the rare contrabass sax with Stan Kenton this summer at Disneyland and on tour. Previously, Bill has been a member of the Claude Gordon, Ralph Flanagan, and Billy May bands. His arrangements are in wide circulation in Jazz circles. The annual Southwestern Youth Music Festival, held in Long Beach on August 13, 14 and 15, drew a grand total of nearly 700 young musicians. The School of Music of Cal Arts is proud to announce that once more students of Earl C. Voorhies, Chairman of the Piano Department, came away with many prizes. In this Festival there is what is called the "Open Categories" for outstanding students, and there are ten events. Students of Mr. Voorhies entered five of these and won first place in four of them. In addition, two students won the coveted Jane Stanley Memorial Award and the Ethel W. Putnam Award. Four other Voorhies students won 2nd, 3rd and 4th places. Neal Brostoff, a Voorhies student, who performed recently at the Pavilion of the Music Center for Spring Conference of the Southern California Symphony Association, has been chosen to play a piano concerto by Carlos Chavez in a forthcoming concert by the Burbank Symphony Orchestra. Harry O. Diamond, former member of the Board of Trustees of Chouinard Art Institute and Advertising Design Department Chairman, is now head of the Graphic Design Department of Standard Oil Company in New York. TN6501: 9600 dpi jpegs from original printed matter from the collection of Tony Newhall, whose father Scott Newhall was a member of the CalArts board of trustees.